Earn to Die is a popular name in terms of new car games and today you will be fighting against the zombies once again because you have reached a new infested area and the only way to pass is by constantly upgrading and tuning your car. With the money earned in each race you will be able to do so and also the zombie kills will surely add some bonuses. 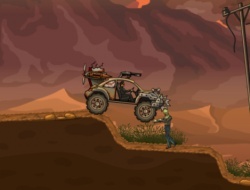 Mount a nice machine gun on the top of your car which will help clear some of the first few zombies because they will slow you down with their dead bodies dragging underneath your car. Earn to Die Part 2 4.00 between 0 and 10 based on 1 votes.